Access: There are four main access points to this Conservation area: Woodside Drive, Bare Hill Road, Green Road (across from the intersection of Nourse Road) and Vaughn Hill Road. The Woodside Drive and Vaughn Hill Road entrances also have parking areas. Description: The North Peak of Vaughn Hills is one of the highest elevation areas between Boston and Wachusett Mountain, offering panoramic mountain vistas. Trails also traverse pine forests, follow creeks and streams, abut beaver dams, ponds and open meadows. Hiking can be extended into Bower Springs via trailheads on Bare Hill Road. 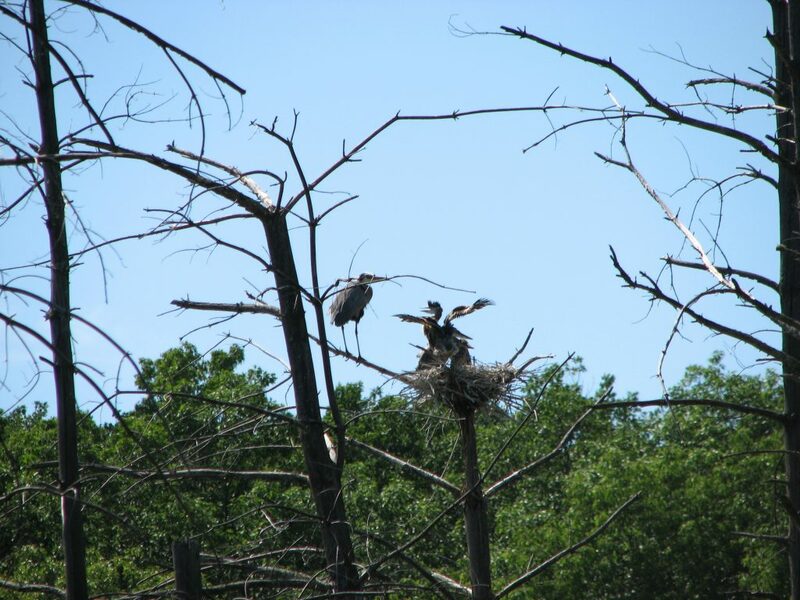 6.14 – Larry photographed two nests of Blue Herons from the pond loop trail.